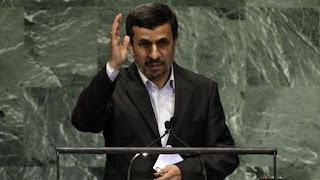 Home » iran , mahmoud ahmadinejad , united nations , united states , what the hell were they thinking » What good is the United Nations, anyway? What good is the United Nations, anyway? I always thought that the purpose of the United Nations was for countries which recognize each other to come together for the furtherance of peace. That it was meant to be a platform for raw hate and threats of violence seemed anathema to that purpose. But this week Iranian leader Mahmoud Ahmadinejad - head of a government which has done more to sponsor terrorism than any other during the past thirty years and which has consistently threatened the safety of the United States - has addressed the General Assembly of the United Nations. And once again Ahmadinnerjacket or whatever the heck his name is, has vowed to wipe the country of Israel off the map. There are two questions that I can neither find suitable answer to or rid my gray matter of. First: Why the hell are we letting Ahmadinejad/Ahmadinnerjacket into the United States? I don't buy into the notion that the United Nations is "neutral international ground". Ahmadinejad is not only the head of a government which has sworn itself as an enemy of the United States, but there has been substantial evidence in recent years that he was involved in the taking of hostages from the American embassy in 1979. Imadinnerjacket should have been arrested the moment he landed. He certainly should not have been given free parking for his Air Iran jet at Andrews Air Force Base: the same place where Air Force One is kept and maintained. Second: Why does the United Nations tolerate and even invite the presence of such a man and the government he represents, when neither have demonstrated that they have any intent of civilized and peaceful co-existence with their neighbors? I understand that in the history of mankind, and no doubt for all the millenea to come, nation will disagree with nation. Sometimes those disagreements come to martial clash of arms. I've never been so foolish as to believe the United Nations could ever bring about total peace on Earth: that would be a miracle left to God Himself, so fallen and inept is the nature of man. Even so, that whole "swords into plowshares" thing, I thought the United Nations took that seriously. And cheering the mad ravings of a genocidal lunatic is the furthest thing from diplomatic civility in the pursuit of peace! It's like this: either the United Nations demands that its member states acknowledge and respect the right of each other to exist and to utterly strive to avoid war, or the United Nations stands for nothing more than being a colossal joke sitting on the East River in Manhattan. One of the bigger criticisms of the League of Nations was that it was too weak to have prevented World War II. Might future history books record that the United Nations was incapable of reigning-in one of its members from igniting World War III? If not, and if the United Nations is tolerating such behavior even now... then what good is the United Nations at all? You are certainly correct, in my humble opinion, that the U.N. is incapable of doing what it was meant to do. It won't stop WWIII. It couldn't even stop a piddly little guy like Saddam Hussein. Or stop North Korea from developing nuclear capability. Etc. The reason the U.N. tolerates this behavior, however, is because it was designed in a way that gives them no power to stop it. The U.N. is bicameral. The General Assembly has no enforcement authority whatsoever, so it's basically a debate club where people can come in and rattle their sabers and complain but nothing ever really happens (which is where Ahmadinejad was). The Security Council was supposed to be the 'meat' of the organization with enforcement authority, but the founders were so afraid of that authority ever being used that five powerful countries were given veto power, and there's no way to override a veto. So it rarely, if ever, authorizes that enforcement power. Last time that I know of was the Gulf War, and the UNSC didn't even act on that until Saddam actually full-on invaded a neighboring country. In theory, the U.N. was supposed to be able to stop that kind of thing from happening AHEAD of time. Every recent effort has been vetoed by Russia and/or China...forcing 'western' nations to act unilaterally, through NATO, or in ad-hoc coalitions. As for arresting Ahmadinejad...as a matter of policy, we let any head of state travel to the U.N. We agreed to host the U.N. here, and have a responsibility to be even-handed (as annoying as it might be). To my knowledge, we've only once refused to issue a U.N. visa -- in 2007, we did not allow a foreign minister of Abkhazia to enter. But that's because Abkhazia isn't a recognized country; it's part of Georgia. I would argue that even that was pushing it, since Russia wanted to allow them in and we've previously issued visas to the president of Kosovo, which is also not a recognized country. Anyway, as U.N. host, we have to play nice (to a point) even with schmucks like Ahmadinejad. The only real way around it is to stop hosting the U.N. ;-).